The Green Lipped Mussel extract for horses in MaxaBreathe contains high levels of Omega-3 ETA fatty acids, which are known to have natural soothing properties. Key anti-oxidant ingredients, including Vitamin C, work alongside the Green Lipped Mussel to help clear congestion, reduce coughing and ease irritated airways. 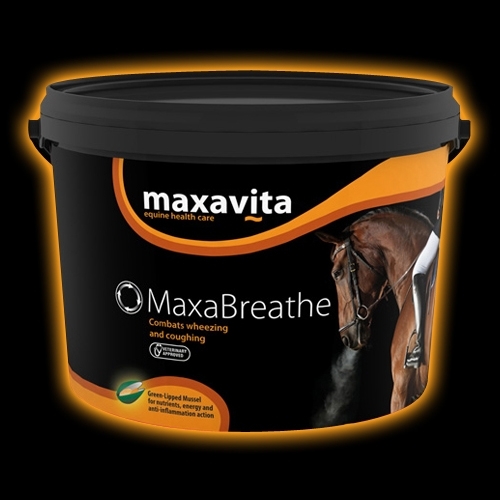 MaxaBreathe helps to maintain healthy and natural breathing in the stable, field or during exercise. MaxaBreathe also contains a blend of soothing herbs that have been selected to help ease irritation in the airways. Alfalfa is also added for maximum palatability. MaxaBreathe contains no listed banned substances. Green Lipped Mussel may help to soothe irritations which causes coughing. The horse’s natural source of vitamin C is fresh grass and other live plants. Hays and grains contain essentially no vitamin C – opening a need for a supplement especially during winter months. It is also renowned for its antioxidant properties and is essential to formation and maintenance of connective tissues (joint cartilage, tendons, ligaments, and the skin and bone). Yeast is a high quality source of readily available soluble amino acids, peptides, vitamins and essential elements. Anti-oxidants are compounds that inhibit oxidation within the horses body. They help remove the free radicals within the system and reduce damage to cells. Soothing sage and elderflower, antioxidant garlic and lemon combined with Alfalfa for maximum palatability. Our little mare had coughed her way through last winter. Since giving her one scoop of MaxaBreathe in her feed, there has been a dramatic decrease in her coughing fits. I just had to let you know what a difference your MaxaBreathe supplement has made to my 17yr old cob mare, Duchess. She suffers from allergies every summer and nothing I’ve tried before has worked. Duchess has been on MaxaBreathe for 5 weeks now & she’s a new horse! She has not coughed, sneezed and does not get breathless after exercise, & she is so much happier. A big thank you from us both.